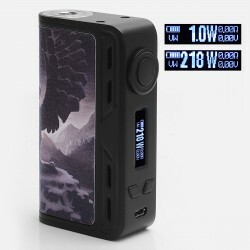 Have you checked the Original Smoant Charon 218W Box Mod ? The Original Smoant Charon 218 Mod is the latest compact mod by Smoant. It is powered by ANT 218 chip, stability, along with high-tech upgradable technology providing no delay at all. With 1~218W output power, VW mode supports 0.1~5 ohm atomizer, better to satisfy all your demands. Temperature control mode supports Nickel-200 / Titanium / Stainless Steel / TCR, and the resistance range is 0.1 ohm~2ohm (TC). Temperature range is 200'F~600'F / 100'C~300'C. High quality leather material makes Charon 218 soft and comfortable in your hand. More venting holes design keeps the mod and PCB cool down for longer lifespan. 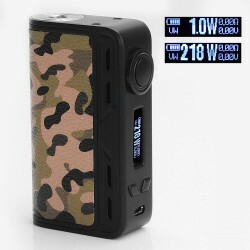 Powered by 2 x 18650 batteries, the mod can also be charged by USB cable directly. Original Smoant Charon 218W TC VW Variable Wattage Box Mod $45.99,many fashionable colors for you to choose.